I moved to NYC when I was 17 and went through a big transition as you can imagine! Limerick City Ireland is quite different than New York City. I loved the bright lights and the adventure of new people and so much diversity. However as an empath and very sensitive person it often took its toll in the form of heavy anxiety and a need for control! 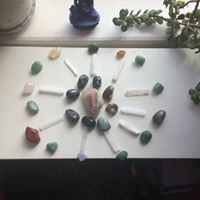 Luckily I found a little crystal shop in the middle of union square that became a sanctuary for me and I would go there and feel the energy of the stones and started to buy one crystal every week. I knew nothing about them. I would just hold them and get a feeling and then would meditate and work with each one for a week. I also started a little journal for all my discoveries. It became a guide to the Crystal Allies and what they were telling me of course I had no clue about that stuff at the time. I didn’t really know what I was doing! I was just having fun. Since then my love for crystals and all things in the elemental kingdom has grown. I was blessed to work with the rock Whisperer of NYC Krista Mitchell in 2010 and became a Crystal Matrix Reiki Master. I also spent time in the Catskills of New York journeying with the elements. 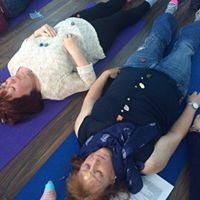 I have also been influenced by my many travels to places like the rainforests' of Costa Rica and of course the magic and splendor of our gorgeous homeland Ireland where the fairies dance freely all around us. I’m very honoured to live in this mystical land. 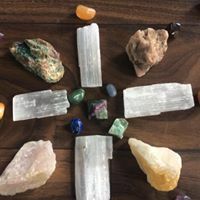 Crystal Grids are a systematic way of combining crystals into a specific pattern or geometric arrangement in order to amplify or intensify the intention that you want. Each crystal must be programmed with this intention. This can be done one crystal at a time or you can do all crystals together at the same time. I work with Crystal grids during the time of the new moon to welcome in new energy and set new intentions. I also sometimes work with grids in the full moon time to shed patterns that are no longer healthy including beliefs, ideas etc. I also use grids to send out healing to people, places or situations. 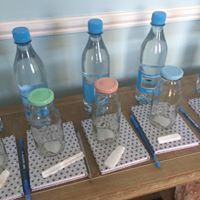 If you follow me on facebook you will often see posts around the new moon or full moon where I set up grids for myself and anyone that wants healing energy. You simply write out all the names and place them in the centre of the grid under your transmitter or centre stone. The crystals for your grid are more potent when they have the same job or intention as it were as your overall intention- for example aventurine is an abundance, adventure and heart opening stone. If you are using it for protection of course it will work for this if you program it but it is not its true nature. For protection use smokey quartz, tiger eye, obsidian, black tourmaline and so on for protection. Again there is no wrong right here as long as you honour yourself and your stones and you are making intentions for yourself only. You need permission to make or set intentions for other people so always bear that in mind. Again always go with your intuition when choosing your crystals and make sure they are around the same size. The centre or transmitter stone can be a little bit bigger but for the energy to flow smoothly and evenly it is best if they are equal in size. You may want to use a pendulum if you are familiar with the process of dowsing to help choose your stones.